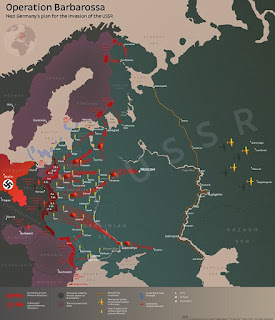 The might of the German Wermacht is rolling across the Russian steppe in a vast unstoppable blitzkrieg, and our attention turns to a small village somewhere in northern Ukraine. The Germans had paused outside the town and for 6 hours their artillery had reduced the place to ruins. The people had fled east, but the Red Army was still in their boltholes, ready to fight once the Germans came in. And come in they did. The Russian jump off points (in Red) have been pushed into the village by some excellent German patrol work. The Germans will be arriving along the blue arrow lines of advance. The first actions was on the south flank, as an Infantry section took up position in the woods. Its MG34 team set up in the building, ready to surpise Ivan if he tried to put up a fight. Spotting the Germans, the comrades took up position in the ruins, and immediately called down mortar fire on the Fascists. Comrades! the Fascists are here! Open fire!! The dear leader takes up a central commanding position. Mortar fire will do some damage throughout the game. It was a ruse! With the Russians revealing their position, a StuG rumbled up and put a shell into the building. It shattered and began to collapse in flames! The survivors tumbled out and sprinted forwards in blind panic to seek cover behind a stone wall. The Germans jumped forwards, and set up enfilade into the hapless Russians who were steadily cut to pieces by the vicious MG34 ("Hitler's Buzzsaw"). 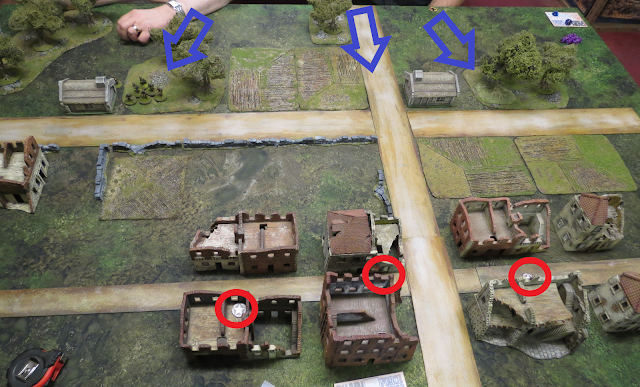 Chopped to bits, pinned, and then broken, the Russians flee but are cut down to a man before they reach safety. The Reds respond to the StuG by calling up their T26 armoured support. The tank traded many shots with the StuG before finally the superior German armour's shells tore through the T26 and forced it to withdraw. 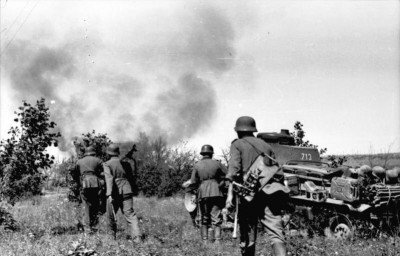 Meanwhile on the northern flank, the Germans brought a second section forwards therough the woods, and the Russians countered again; they swarmed up into the outer ruins and give some serious fire into the Germans, stopping their advance. The Russians get the best of the early exchange. A German light howitzer rolled out of the southern wood and with a single shot, flattened the building! The Russians within were killed by the blast, the collapsing building, and as they staggered out shell-shocked and covered in brick dust, they were mown down by German machinegun fire. The pattern on the southern flank was repeated on the north. Red Army morale was collapsing and the Germans were pushing hard; but they didn't have the field yet. A second line of Russians jumped in and cut the southern German flank to pieces, including killing their platoon commander! As that shocking news spread through the German lines, their morale became shakey! The German southern flank is wiped out! But they'd done enough and as they finished off the Russians ahead of them, the Red Army withdrew to find better ground to defend. Phew! An excellent battle, with a surprisingly close finish. Two more points off the Germans and it would have forced a draw. But it was a close run thing. The turning points in the battle were the German high explosive shells that amazingly flattened both the buildings they hit! 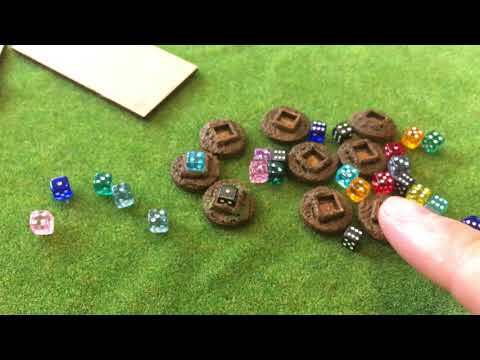 The chances of this happening are slim but sometimes the dice are with you. With the Russian front line destroyed by those collapses it opened the battle for a German victory. We're loving Chain of Command at the moment and this will become a regular event on our table, for a while at least. 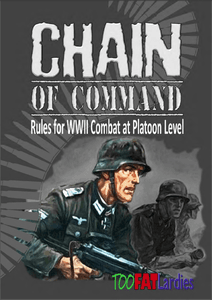 Starting a new project for the Too Fat Lardies excellent "Chain of Command" (CoC) WWII rules. I already have a 28mm Russian platoon (which I created for Bolt Action http://luddite1811.blogspot.com/2014/10/bolt-action-russians.html), but I figured I need some Germans to challenge them. So far after two build sessions I've finally constructed the contents of the Warlord "Blitzkrieg Starter Set" (with an additional HMG team). Turns out, as CoC is an actual historical set, for the early war I need an additional Infantry Section, so I'll have to pick that up. The Warlord set also includes prone figures integral to the squad build. I really dislike prone figures on the table top so I'm a good few figures down, and will have to get a couple of senior commanders separately. Also, I absolutely can't stand multipart plastic kits and the Warlord kits are particularly troublesome, being super-fiddly and difficult to assemble - particularly lining up the spearate arms and guns. Multi-part plastic is the standard in wargaming now though, so its a neccessary evil that I have to go through the rigmarole of glueing all these tiny little bits together. The basing on these Warlord figures is wholly inadequate so I'll need to get some proper bases too. Still, next up is the undercoating. Black or grey for the vehicles I think, and maybe an olive green for the infantry. As these are for "up to 1941", so as Germans used a simple flat grey on all their vehicles during this period, they'll be the flat dark grey. Uniforms of all protagonists were fairly varied, and the Germans are no different. 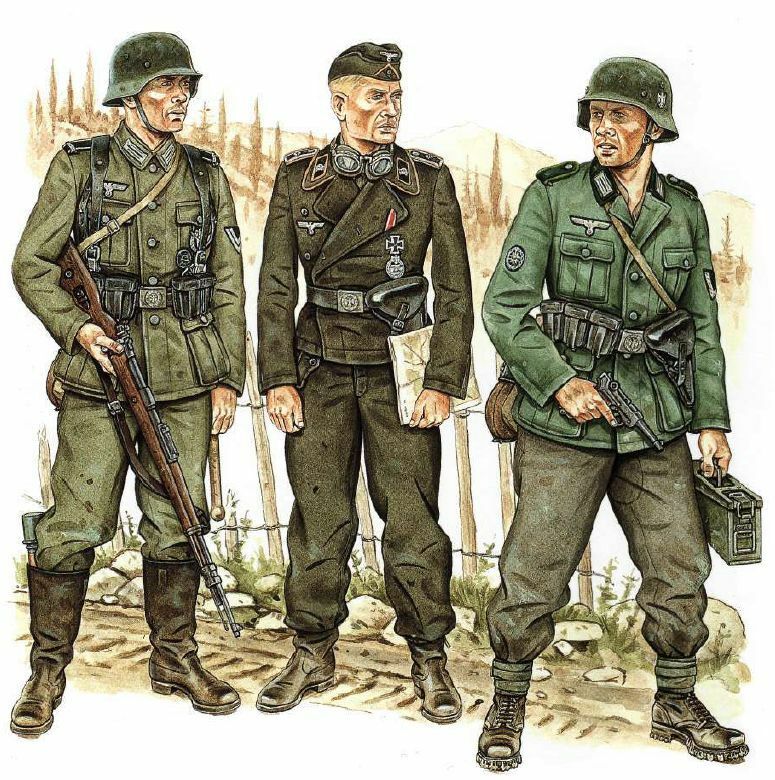 However, in the early war the Heer division infantry general work a mix of green and grey so i'll paint them generally with dark green tunics & dark green or grey trousers. EDIT 1: After a productive evening's painting, I've got the infantry done to "base colour" stage. This took a little longer than expected as I don't have a "feldgrau" paint and had to mix up a colour as I went along (a couple of greens mixed with grey). It came out OK I think. Next up the washes and highlights and these should be done. I'll probably do these vehicles first before I dive into the infantry again. Facing the hated "fiddly glue stage" takes some building up to for me. EDIT 2: Progress tonight and I've finished off the washes, details, and completed the vehicles. Everything is now based, but I still need to do that actual basing. I may leave this until I have everything ready. I need to get some larger bases for the weapons teams and snipers anyway. 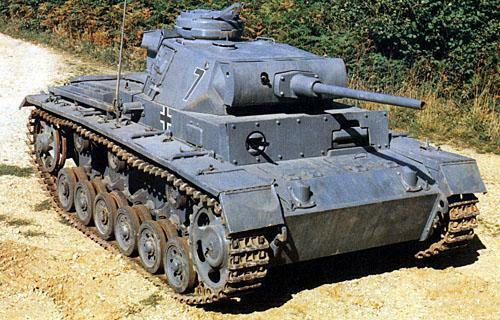 Panzer IV D in the early war German grey. I'm pretty pleased with this; it's hard to make a good show of the flat colours for WWII vehicles, so I perked it up with some shading, a bit of damage, dirt and general "battle fatigue". Early war 7.5 cm leichtes Infanteriegeschütz 18 infantry support gun. Used throughout the war it was a lightwieght howitzer that was a perfectly satisfactory weapon. It was mobile enough to keep up with infantry platoons, and was also used as a mountain gun and with airborne formations. Next up, I'll be making the 4th Infantry section, the platoon commanders and extras like leaders armed with the MP40, adjudants and medics, etc. EDIT 3: tonight I only got a short time. No painting, but I started to assemble the additions and options for the platoon. I'd hoped to also put a medic, adjudant, the rest of the 4th Section, and some additions for the support weapons crews together, but ran out of time. The Warlod infantry platoon box (with only 30 figs - not enough for a full early war German platoon) is what I'll be using to construct the various options and additions. When I made the three sections I gave the leaders rifles. Turns out in the early war, they should have MP40 SMGs so I've made these 4 new leaders. The ones with rifles will find use as additional support weapon crew. And the 4th Section Spandau MG team (gunner and ammo carrier). Only 7 riflemen to go! EDIT 5: ...and everything's made and ready to undercoat. Except the Forward Observer team. I've ordered some bases and need them to arrive before I make that team up. EDIT 6: the platoon is mostly now finished. Only the spiner team's basing to finish off, and I have a "forward observer" pack I've not made up yet - not sure I need them really. This was a fun project to run, and I finished in in around 20 hours. They'll be going into action tomorrow night against the Russians in Operation Barbarossa. MG34 "Spandau" in medium machinggun configuration with a dedicated support team. These were the workhorses of the German Wehrmacht throughout the war. German infantry tactics revolved around their machineguns. The ie18, a light, mobile and overall effective close infantry support "howitzer" gun. This platoon is a Heer formation from the early war "Blitzkrieg" period, made up of a mix of conscripts (conscription in place since 1935) and volunteers.